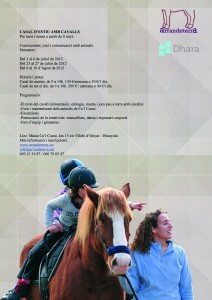 This year, Arrandeterra organized three separate farmsteads summer and one week each. In the farmhouse of Ca'l Cucut in Vilobí d'Onyar, do activities and games with farm animals-school, but above all, we learn how horses live, how they relate, handling, ride, etc .. .
Games will enhance team cohesion, creativity and values. From 2 to 6 July 2012. From 23 to 27 July 2012. From 6 to 10 August 2012. Casal de morning: from 9 to 14h. 150 Euros / week or 30 Euros one day. Casal all day from 9 to 16h. 200 Euros / week or 40 Euros one day. To register, fill out the web form. This entry was posted in couple, Coaching with horses, colonies, Formation, Training, Taller. Bookmark the permalink.